The day started out much as any other for Orsia Wentworth. She woke from a night of heavy drinking, her head swimming but her purse only a bit lighter for the experience, draped in the arms and discarded clothes of strangers. Personally, Orsia found herself in the arms of a very lovely, pale-faced, red-headed woman who might be Armani. She didn’t remember a thing about this woman but rather enjoyed how warm she felt. Vaguely, Orsia recalled coming into the bar, pulling along her friend and confidante Dell, but from there it became even fuzzier. One man at the bar had questioned her right to carry such a fancy sword, and she distinctly remembered handing him his boots after she knocked him flat out of them. The night only went better from there. As time passed, her natural charm came into play and her fellow carousers tended to buy the drinks. Orsia remembered harrowing tales of her exploits, some of which were even true. At one point, she’d climbed up on a card table to demonstrate a few of her flashier moves, though she didn’t remember precisely when that had turned into general dancing. And in the end, even a typical night with Orsia in the bar reached a level of debauchery and merry-making to rival yearly festivals. The chaotic atmosphere appealed to her rebellious nature. For one, it scandalized her prim and proper parents, who approved of her drinking and dancing even less than her swordplay. It hardly mattered: Lord and Lady Wentworth generally treated their second daughter with disappointed neglect when they noticed her at all. There was a reason she didn’t use the Wentworth name when she went out at night, and she’d seen her family only a few times over the last year. But even above that admittedly delicious subversion, mingling among the commoner folk was itself a challenge to the Empire’s rigid social structure, and Orsia liked that. The idea that hard workers with dirt on their elbows could share cups with merchants or even nobles (albeit keeping their higher station a secret) made Orsia tingle all over. In her eyes, people were people, equally worthy of respect. Eventually, after the drinking and romancing of the evening was done, everyone slept deep to await the morning and its dull return to reality and responsibility. Work would have to be done, food put on the table, and families cared for. Unless this day brought something different. Which is exactly what came to pass that morning. Orsia stirred when the door burst open, and a crimson-skinned prymidian in colorful garb strode through, stroking his braided silver beard. His flamboyant attire and bold body language marked him clearly for a bard, even though he had no musical instrument that she could see. With a superior eye, he surveyed the room full of groggy patrons. Their general state of haphazard disarray seemed to worry him not one whit. If anything, their lack of attention seemed to be what irked him. He turned and was gone. Leaving her companion of the evening with some reluctance, Orsia staggered out of the booth in search of her friend. True to form, Dellthora Norfolk was already up, scrabbling on a parchment at the bar, and looking none the worse for wear after the events of the previous night. Odds were, she’d contented herself with just a single glass of watered wine, the better to watch out for her less responsible friend Orsia. A warm drink on a clear winter morning in Nyssa was one of Orsia’s favorite experiences. The wind flowed from the west into the capital of the Caneus Empire, center of the old kingdom of Nas, bringing with it just enough temperate air to offset the worst of the hinterlands’ chill. It felt brisk, but not the sort of bone-splintering cold Orsia remembered well from entirely too many travels away from civilization. Her heart was here, in this city, surrounded by thousands of people from all manner of lands and paths, walking the cobbled streets under the watchful eye of looming brick towers. A flock of snowbirds drifted past overhead, blending in with the wispy clouds. The colors and fashions—the hundreds of languages and multitude of faces—it all made her feel at home. And today, Orsia meant to make her mark upon the city, just as she and Dell had dreamed of. While her dearest friend rambled on about strategies and technique, Orsia sat in a café off the Rhone Plaza and sipped mulled wine, gazing up at the towering Gregorian Palace of the empress. Cassandra Eland had come to power only recently after the regicide of her eldest sister Mercy at the hands of their brother Bial—himself second in line for the throne. There were whispers, of course, that Bial was innocent, but his flight to the Reis Confederacy seemed quite telling. Cassandra had wasted no time crowning herself empress, with her meek younger sister as imperial executor, so it remained to be seen how effective they would be in ruling the empire. Shame about all the deaths, but at least in Cassandra, fate had bequeathed Nas a ruler worthy of respect and adoration. Orsia had seen the empress once, during her sumptuous coronation. Cassandra Eland was a powerfully built woman, confident and beautiful despite—or perhaps because of—the vicious scar on her face. She’d obtained that mark in combat during the trials, Orsia had heard, and from the leonine grace of Cassandra’s movements, she could believe the tale. Orsia knew a warrior when she saw one, and given the opportunity to cross blades with the empress, she would leap at the chance. And perhaps, if Cassandra was impressed by her natural talent and good luck, she might ask Orsia to serve as her personal bodyguard. Very personal. So she was half in love with Empress Cassandra. Who in Nas wasn’t? Orsia swept her hand through empty air, realizing too late that Dell had taken her wine. Her mind had wandered again, down the exciting paths of adventure and romance and derring-do. Dellthora Norfolk looked unimpressed. Orsia’s flirtations always rolled off Dell. It was probably why they had remained friends for so long. Orsia took Dell’s hand and pulled her friend along almost too fast for her to collect her notes. Hiring a bard to drum up interest seemed to have worked, for Orsia counted at least a hundred people in Rhone Plaza. Most were humans of one shade or another: gruff soldier types in hodge-podge armor, steely-eyed scoundrels bristling with blades, and a few foreign barbarians in heavy furs with cumbersome weapons. She noted a trio of rat-faced cavians, keeping mostly to themselves in a small cluster that bristled with weaponry—notably at least two crowsbeaks. Most considered the hafted hook a peasant weapon, but these looked particularly well made. She’d have to be careful around them. Khavren himself was nowhere to be seen—or, at least, Orsia didn’t see anyone she would have labeled as the famous swashbuckler. She’d never met him, after all. Chenoa Gryn was present, though, his prymidian skin like burnished rosewood gleaming in the thin light that pierced the clouds. Away from the deserts of his homeland, he looked entirely too cold and a little bored. “Hurry!” Orsia urged Dell on, but her friend’s bulky winter dress hobbled her. Finally, Orsia let go of Dell’s hand and scurried forward herself, pushing unceremoniously to the front of the crowd. The three cavians glared at her, muzzles wrinkling in angry challenge, while she put her hand to the hilt of her rapier. Not to mention everyone in Rhone Plaza seemed to be staring at her. Awkward. “The fee.” Orsia hesitated, patting her belt pouch, which felt a little light. “Of course.” She didn’t remember anything about an entrance fee. The cavians were clustered in a little group, piling coins and bits of jewelry into a communal pile, which they had been doing when Orsia came rushing up. They probably almost had it. One of them was still giving her the old weasel-eye. Orsia stared down at all the coin her friend was shoving at the bard. “It was what I could scrape together.” Dell looked to Orsia and frowned. “What did you imagine I was doing all morning?” she asked under her breath. Orsia made to reply, then realized that there had indeed been some time since her friend had taken leave from the table. Orsia had thought it just a few moments. Finally, she simply nodded. Orsia barely had time to start forming a reply before the cavians were on her, all three attacking in a sudden wave. Only instinct and honed reflex brought her sword out in time, poised to catch a charging cavian through the thigh to discourage their mad rush. They circled her, hissing and snarling. “Ors—” Dell staggered back, murmuring quietly. She’d always been the talker, Orsia the fighter. One of the creatures staggered back, unnerved by her sheer indifference to the threat they offered, but the other two went unfazed, including the one she’d stuck with her rapier in that first moment. They came at her as a loosely coordinated team, but she saw the holes in their tactics immediately. She dodged left to put the first one between herself and the second. The cavian jabbed wildly with his spear through the air where she had stood, and she poked him once, twice, thrice in quick succession with her rapier. One down before he’d even had a chance. The second cavian—this one female—hissed as she pounced on Orsia, and it thrust at her with a crowsbeak. Orsia managed to nick the cavian’s hand with the tip of her rapier—one of three wounds—but realized that in her eagerness she’d made a mistake. The cavian locked the flanged head of the curious weapon around the strong base of her rapier and ripped the sword out of her hand, sending it to clatter on the cobblestones. Orsia leaped back, but the cavian swept up the crowsbeak and smacked her hard on the chin. Orsia staggered, blood welling at the edge of her jaw. One wound to her. The crowsbeak came at her face, and Orsia narrowly ducked aside, feeling her hair rustle in its wake. She stepped in close to the cavian, drawing a long knife from her belt as she went. She cut upward along her arm, wrenching a yelp of pain from the creature. Then, pressing her boot into its hip, she pushed the cavian away while kicking off into a backflip—an entirely unnecessary but deeply satisfying flourish that drew several gasps and even some scattered applause. Orsia landed on her feet with a snarling cavian bearing down on her. 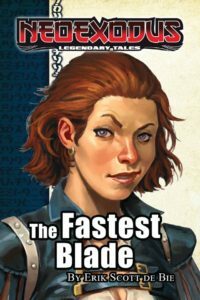 She flipped the knife in her hands and hurled it right into the charging cavian, smacking her hard in the face with the pommel. The cavian pulled up short, startled and a little confused. Then blood started to run from its nose, and it staggered back a step. Orsia looked to her last attacker, who had hung back, white-knuckled fingers working on the haft of his crowsbeak. She held his eyes as she wedged a toe under her fallen rapier and flicked it up into her hand. She smiled. The cavian threw down the crowsbeak and put up his hands. Silence gripped Rhone Plaza for a moment, then it burst into applause and cheers. Those who had come to watch some excellent fighting were highly entertained, and those who had entered the tournament looked at Orsia with wary respect. Even Chenoa Gryn’s blank face split into a pleased grin.